Fives offers the largest range of Abbey and OTO electric resistance welding tube mills (ERW mills) dedicated to the production of ERW tubes from carbon and stainless steel: diameter range from 4mm to 762mm, wall thickness from 0.4mm to 28mm. 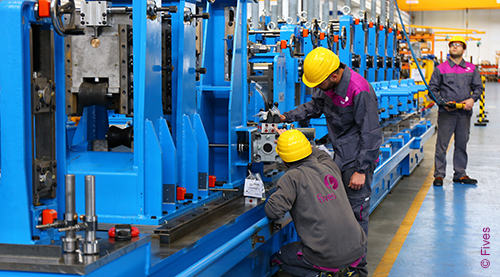 Fives qualifies all incoming raw materials and manufacturing components used in the production of their machinery, before they are incorporated by skilled craftsmen. The mills are then pre-tested in the Fives' workshop in Boretto (Italy).